If you’re a fan of food writer, Paris by way of San Francisco transplant and pastry wizard David Lebovitz, you’ll be tickled to hear he’s come back for a visit. If you’re not familiar with hombre, here’s an intro. I know him mostly from his great blog but previously he’s worked with Alice Waters, written the ultimate chocolate book , a book about ice cream and most recently published a memoir about his food adventures while moving to Paris in 2002 called The Sweet Life in Paris . His visit popped onto on my radar when some burrito tweets appeared from his twitter stream. If there’s one thing I’ve learned, the only time you’ll hear burrito tweets is when someone is traveling to or away from San Francisco. Turns out David Lebovitz (can I just call him David? Dave? Davideano?) came back for some book signings and to speak at the BlogHer Food Conference (held Sept 26th). 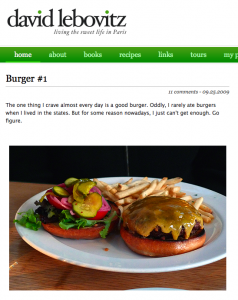 Want to follow a great food mind on his SF adventure? So far he’s been to Serpentine for their burger, sampled Humphrey Slocombe ice cream and conquered the Charles Chocolates S’More (how have I not heard about this?!?). I’ve been tickled to hear what he’s chosen to do and he’ll hopefully continue to blog about his food exploits on and talk travel on twitter. He’s got a handful of book signing appearances on his site but you’ll catch me catching him on Monday night at Omnivore books. Undoubtedly, one of the greatest discoveries since living in San Francisco is the idea of community supported agriculture. By joining a CSA, local farms hook you up with incredibly fresh produce and the warm fuzzy of knowing that your food purchases are making a considerable impact. I can’t remember how I first heard about my CSA, Eatwell Farm, but it’s a pretty incredible deal. Although slightly more expensive than grocery store produce, there is something to be said about the quantity and assortment I find in my box every week. Not to mention the enjoyable task of eating all your veggies and finding new ways to prepare items for each meal. It’s also been a great lesson for this thing called ‘the seasons’ where geographically, some fruits and veggies have a limited growing time in northern California. Tomatoes mean OH MAN it’s summer while squash means winter! And soup. Thus far, I’m planning on sharing my weekly box with you all. And by all means PLEASE lemme know if you’ve got a killer recipe or prep idea featuring any of these ingredients! This week, I’m really excited about the tomatillos so if you know of something delicious I can make with them, let me know in the comments or drop me a line. Do you have other questions about CSAs I didn’t answer here? Leave em in the comments! EDIT: I’ll be updating with links from the veggies used in other recipes that are posted on here. First up, the onions were used in the Sesame- Ginger Soba Noodles recipe! I was a weird kid. There was a time when history homework got turned into a sewing project and when a social studies project transformed into an illustrated essay. It’s no great surprise that there are craft projects I’ve been making for so long I’m not even sure when they started. This is one of those projects. Once upon a time, I got a Far Side Wall calendar for Christmas every year. It was bittersweet. I’d excitedly read through the freshly unwrapped calendar but was then immediately faced with changing the guard and removing my year-old companion. At some point, as a means of preservation, the homemade envelope was created. Ever since, I’ve always kept few old calendars around the house to add a nice touch to any outgoing mail. What’s better than getting a letter? Getting one in a kooky envelope. So let’s get to it! 1. Find an envelope whose shape you dig. I’d recommend the boxier shaped one, like the eastern standard envelop without long triangles. 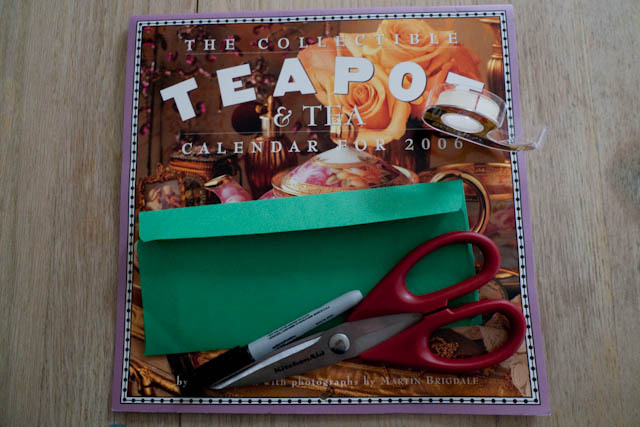 Carefully pull the envelope apart at the glued seams until it’s unfolded and can be laid out flat. Try not to rip the paper. TRY. But if you do rip the paper, fear not. You’ve got two options: one, try again with another envelope or two, fold a bit of tape over the flubbed edge. 2. 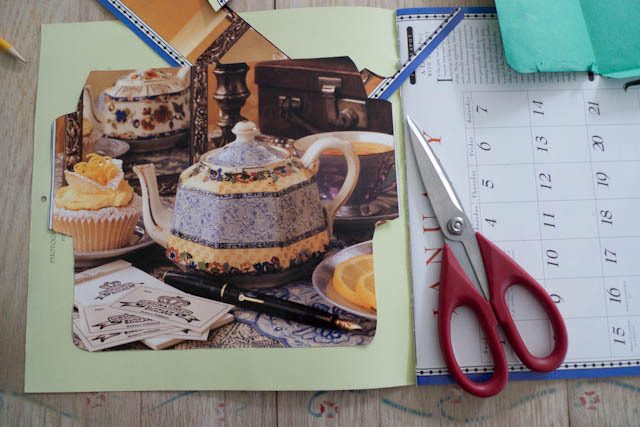 Using the unfolded envelope as a template, place over a spot on the calendar you’d like to feature. Go ahead and pick something nice and pretty or just frame something cool. 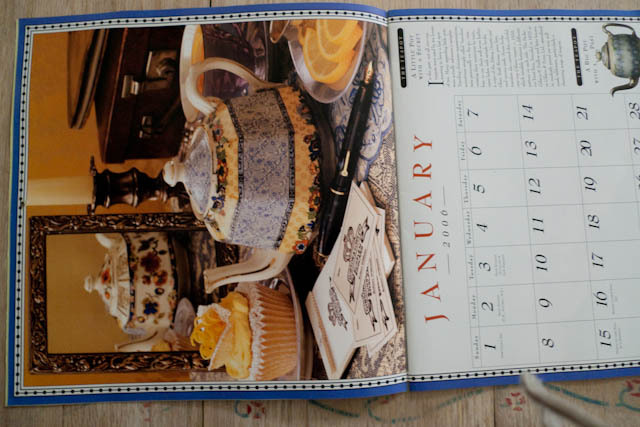 Since the teapot and cupcake is obviously the most prominent thing on this calendar, that’s what I’m squaring up to look pretty. 3. Holding down your template with one hand, trace the unfolded envelope with the marker so that the envelope shape is transferred onto the calender paper. 4. 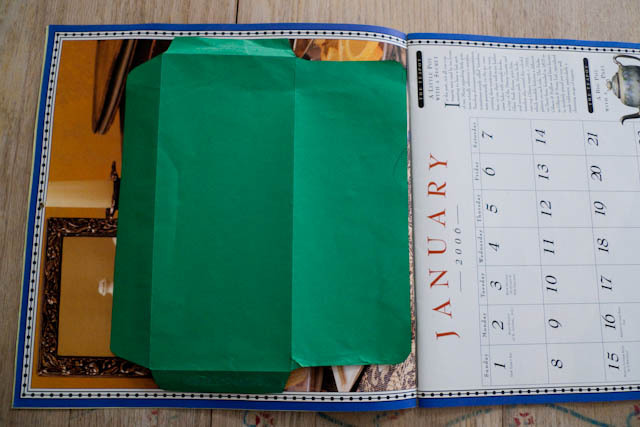 Cut the envelope shape out of the calendar paper. Make sure to cut inside of the line you traced so that there aren’t any marks on the finished envelope. 5. 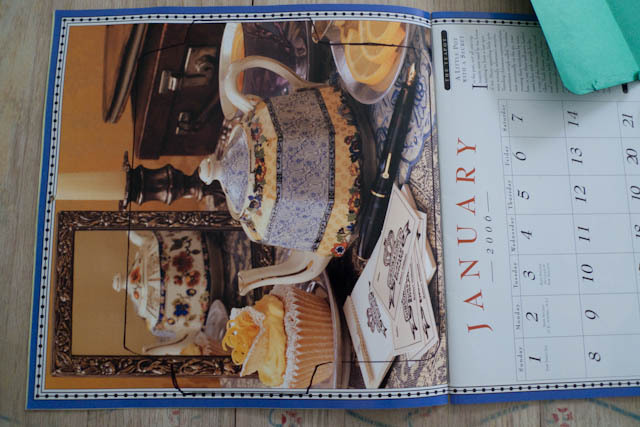 Flip the calendar page wrong side up so that the date portion of the calendar is exposed (in most cases there is a date portion but not apparently this one). 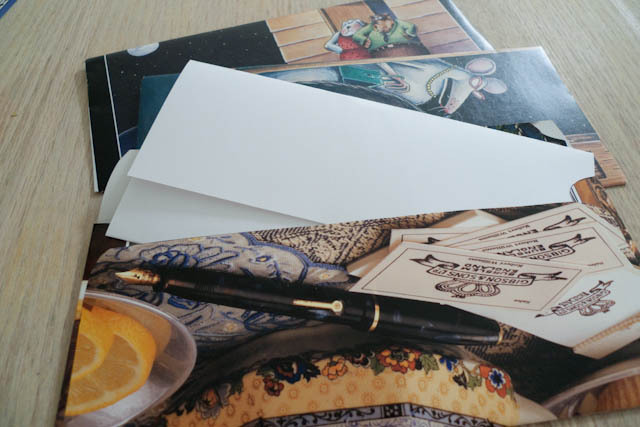 Fold in the same 4 creases as your original envelope template. Make sure that the side you intended to show is on the outside. You should now basically have an envelope, granted it wouldn’t really hold anything just yet. Go over each crease with something sturdy like the back of your scissors to make sure that it is a crisp fold. Go ahead, dig in. Those stiff papers can be stubborn. 6. Using the double stick tape, cut a strip to adhere the back to each of the side flaps. Those short little arms on the right and left of the above picture, see em? Those are the flaps. 7. Press them together, making sure that no double stick take is showing. If it is, trim them with your scissors! 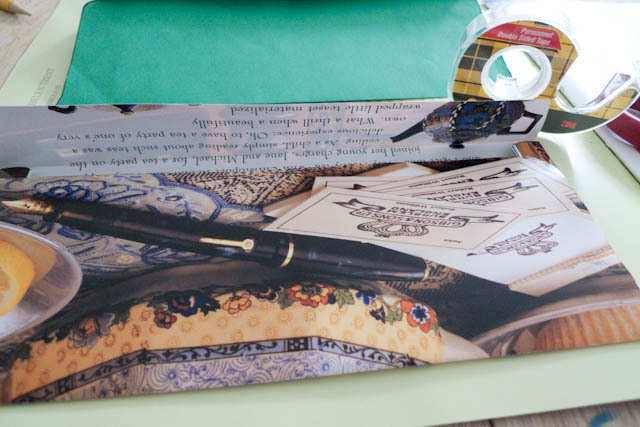 When the time comes for you to mail a letter, you can either use a piece of regular tape over the outside seam to seal it shut or use double stick tape again on the underside flap. 8. If you have a mailing label, stick it to the front of the envelope so that there is space to write the letter name name and destination. 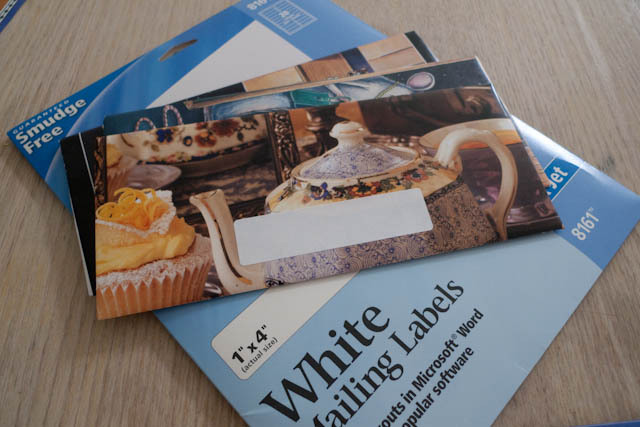 If you don’t have a mailing label, write the address on a piece of white paper, cut it out and stick a bit of packing tape over it. That goes on the front of the envelope. Do the same for your return address. And dude, if you’re not much of a letter writer, there are plenty of other ways to use these envelopes. And if this shape doesn’t fit your purpose, you can make many other types of envelopes. 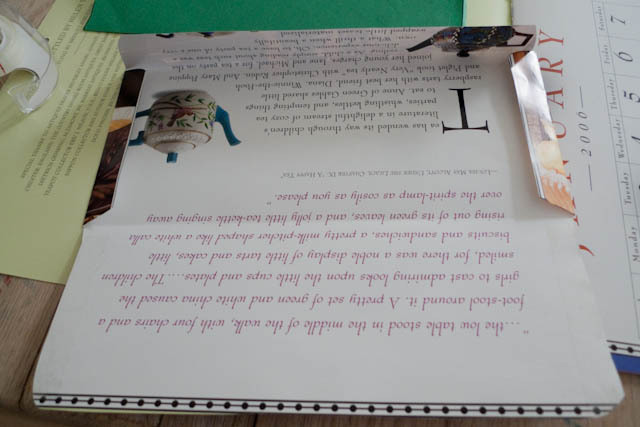 There is nothing stopping you from making them for Christmas cards, to jazz up gift cards, or maybe, JUST MAYBE, you need an award envelope for the Academy Awards. Or to hold your cut coupons. Or to participate in the Write A Prisoner program. Ya’ll get the idea. Because its natural for one to get bored with oneself and one’s own craft projects, I’m extraordinarily interested in what you do with it. So GIVE IT A TRY! And then LET ME KNOW what you made! Seriously want to see what you did. Send me to a flickr link or an emailz and I’ll update this post later with your ideas and successful (or CraftFail?) results.